Cars don’t have as much space as a SUV or mini truck. That’s why some car owners are hesitant to upgrade the sound system of their vehicles, fearing that doing so would compromise trunk space. As a car owner, you don’t have to bring in a big subwoofer to add bass to the existing audio system. 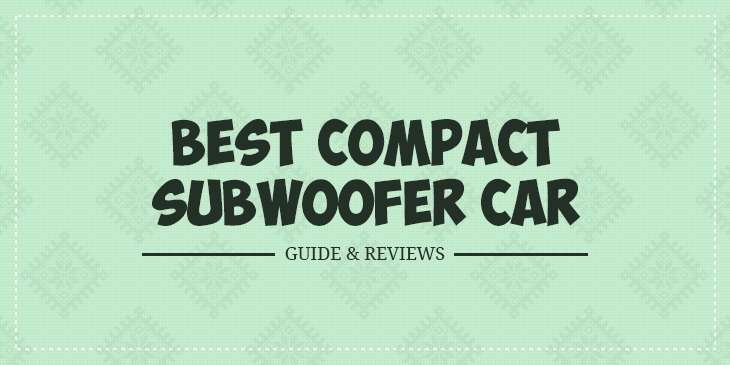 Read on this article about the best compact subwoofer car and find out how you can increase the quality of sound in your ride. You can place a compact subwoofer under your car seat or in the trunk. Don’t worry, as these subwoofers have a small profile. These won’t prove to be a nuisance to your passengers, or take up space in the trunk. Moreover, these subs can improve the bass level of your car’s sound system. It’s safe to say that you’ll enjoy your favourite tunes a lot more when you have any of these subs installed. This is a compact and low profile subwoofer system that you can place under the car seat or in your trunk. It comes with a wired remote control that lets you adjust the bass. And it comes from one of the more popular brands in the car audio industry. One of the best features of the Kenwood KSC-SW11 is its high sensitivity rating. With a sensitivity rating of 110 decibels, this is one highly efficient sub. In layman’s terms, it doesn’t need a lot of power to play loud and clear bass. It can play loud music with less power. You don’t really have to be an expert to install this subwoofer in your car. Installation is pretty simple. Simply wire it to the battery, ground and connect the head unit using RCA cables. According to most reviewers on Amazon.com, this sub can make a noticeable difference in the audio quality of a car’s sound system. Some say the bass is deep and clean but not overpowering. It’s really designed for cars, as those who tried it in their trucks felt that the sub didn’t make any significant difference.The remote control is a welcome feature. With it, you can adjust the volume and bass setting without taking your eyes off the road. This is a top rated compact subwoofer on Amazon.com, with its prohibitive price the only real drawback. Like Kenwood, Pioneer is one of trusted brand. It doesn’t disappoint with this excellent 10-inch shallow mount subwoofer. With a mounting depth of six inches, it should fit under the seat of most sedans. Build QualityI’ve always been a fan of Pioneer subs and this is one is no exception. There are lots of things to love about this sub. The cone is oversized, with a mica-injected molded resin that lets air move better. This, in turn, improves the bass response. I also love its dual spider design. It stabilizes the cone and supports linear movement required to pump out big volume. Installation may not be as easy as the Kenwood unit, but if you have some experience in wiring subs then this should be no problem for you. There are two metal L brackets and eight mounting screws included in the package which should come in handy. Like the other top rated subwoofers on Amazon.com, this one has been getting positive feedback from consumers. Many reviewers describe the bass as clear and accurate. It can definitely improve your car’s audio system, although not in a way that the driver next to you will hear your sounds. This is another space-saving subwoofer that can make a big difference in your car’s existing sound system. It features an eight inch, shallow mount sub plus a 150-watt Class D amplifier. It is a great addition to compact cars as well as SUVs. And because it comes from another revered name in Rockford Fosgate, you can be assured of its good built and performance. If you’re looking for a sub with a lower frequency range, then this should be in your short list. Sure, it is not the cheapest sub that you can find but it does give your sound system an extra boost. The bass isn’t overpowering and obnoxious. This is a sub that is more for drivers who want an easy listening experience. ﻿﻿﻿There’s a comprehensive set of controls on board this subwoofer, so you can adjust it to get the bass level that’s right for you. There’s also a wired remote that lets you change the bass levels from the front seat. You’ll have all the mounting hardware and wiring you would need to install this system. Most reviews on Amazon.com indicate that installing this sub should be a breeze. With a height of 3 inches, this subwoofer will have no problems fitting under your seat. It can complement your existing sound system, specifically add more bass to it. It has low and high level inputs, so you can hook it up to almost any kind of in-dash stereo. What I like about this sub is that you can customize its sound. You can use its wired remote control if you want to add or reduce the bass. If you don’t use that, the sub is automatically set to max level. You can then control the sub level through the unit’s sub control. There is also a variable bass boost that you can turn to if you want to adjust the low bass within your desired boost range. Don’t expect this sub to rattle the windows. It won’t also make your car sound system blast to the point that the guy in the next car will hear your music. Instead, this sub produces bass that is clean with zero distortion. Many reviewers on Amazon.com describe the sound to have a good feel, and one that doesn’t sound to be cheap. Finally, this is Alpine Electronic subwoofer is only 3 inches deep. It should fit in all kinds of tight spaces in your car. Whether it’s in the trunk, behind the seat, or under the passenger seat, this sub won’t take up a lot of space in the car. What I love about this sub is its rugged cast metal enclosure. It can withstand the usual bumps due to its enclosure. The rugged cast metal enclosure makes the unit look like a tank in terms of construction. There’s no cheap plastic to be found in this sub. You’ll know it is a well-built sub just by looking at its body. It may be a bit heavy at 10 pounds, but it only adds to the quality feel. Motorists who have some experience in installing speakers and troubleshooting car audio systems would find installation of this sub a breeze. Some say they took less than an hour to get everything set up. Installation even becomes faster if there are RCA connections coming out of your car stereo. This sub can add a rich, clear bass to your sound system. Again, this won’t shatter any windows in your car or disturb the neighbours. After all, this is just an 8-inch subwoofer and not a 12 or 15 inch sub. But if you’re looking to fill your car with clean bass, then this sub won’t disappoint. This is more of a subwoofer for cars, though. If you intend to put it in a mini truck or SUV, you may be a bit disappointed with the sound quality. Aside from that drawback, there’s really nothing to hate about this sub. It’s hard to pinpoint which is the best sub in this list. Each one has its own distinguishing feature. I guess it’s really up to you to determine which subwoofer would work for you best. The models from the more recognizable brands like Pioneer and Kenwood will always be a safe choice but you might also want to take a chance on the subs from the less popular brands. Whatever model you purchase, one thing I can be certain of is that you would be happy with your purchase. Basing on the reviews on Amazon.com, these five subwoofers are all excellent products. You can be assured of the sound quality and built quality. Perhaps you would base your buying decision on the price. It’s really up to you to decide which one of these subs will be the best addition to your car.